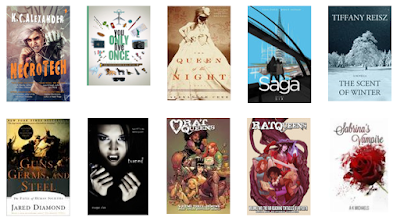 3 graphic novels, 1 short story, 2 non-fiction, 3 DNFs, and 1 AWESOME cyberpunk. This month got me back on the reading train (sort of) and hopefully will be a portent of things to come in 2017. *The average rating was dragged all the way down by those three DNFs. It’s 4.14 without them. 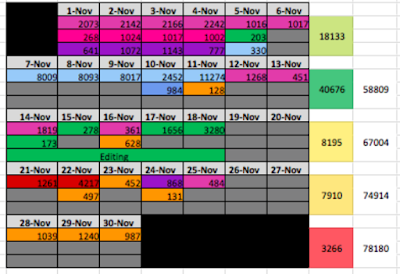 I’d say I’m proud of my focus this month, but if you do the full count, 2/3rds of that count is from admin which is kind of the epitome of a lack of focus. Blog posts like this one, outlines and pitches, some of my business mail, any random bit of writing notes jotted down on my phone while grocery shopping… It’s all stuff I need to get done, but when I see that much orange on a spreadsheet with so little in the way of other writing, I do the scrunchy-face scowl at it. Hey look at that, I finished no books this month. That feels like a first. It’s also a teensy bit of a lie. More accurately, I finished no NEW books. I did a lot of reading of things i’ve already read for fun and profit research. Those don’t count, however, so we’re stuck with that big, fat zero!